Pleasant rumination at a quiet moment: should my new Alfa Romeo Giulia Super be the 150PS diesel or the 200hp petrol? Tom Scanlan drives and compares the latest diesel and petrol Alfa Romeo Giulia models. The starting price for the cars is hugely different: £32,115 Giulia diesel, £31,575 Giulia petrol and naturally you are going for various options and packages and will do some mutually-beneficial financial deal. Luckily for me, not being in that market, I was simply able to enjoy both cars for what they are…family saloons with sporting pretensions. Having driven the cars a total of around seven hundred and fifty miles, I am still on the fence. If fuel economy is high on your list, the diesel, of course, out-performed the petrol, with 51.9 mpg (official combined consumption 67.3 mpg) recorded on the trip computer, compared to the petrol’s 34.0 mpg (official combined consumption 47.9 mpg) recorded in my test car. The two cars have different capacity fuel tanks (diesel 52 litres, petrol 58 litres), so the range between fill-ups will be, respectively, up to 600 miles and up to 450 miles. The diesel engine is one of the best in terms of refinement and quietness. Select D for Dynamic from the car’s ‘DNA’ system and there is a super quick response for acceleration…in diesel cars, with that huge torque of 450 Nm from 1750 rpm, you get one of the big benefits of such engines. In other performance respects, acceleration from zero to sixty-two is average at 8.2 seconds. The petrol engine does it in a much more rapid 6.6 seconds and this really gives this one that extra sporting edge when you wind the engine right up (more sporting exhaust noise here, please, Alfa?). It’s not lacking in torque, either, with 330 Nm from 1750 rpm. It’s is all done through an 8-speed automatic transmission, with no manual being offered. The paddles for manual changes are massive…good idea. This gearbox works well…however, in first gear in slow traffic, and on releasing the brakes, I found the Giulia a bit challenging to keep to really smooth progress — you could compare it to a puppy on a leash. By the way, the paddles for manual changes are massive, good idea. Similarly, braking to a smooth stop from only a low speed was not easy to achieve…could be me lacking the soft touch, but that’s not usually an issue I have. Apart from that, the brakes are super…best in class, claims Alfa Romeo. They call it IBS, or Integrated Braking System, functioning electro-mechanically. It is more irritable than that, the system settings that warn of impending collision are way too sensitive. One of which alarmed me as I was driving at around 20 mph down my local road, there was nothing that I could see that might have been a danger. It appeared to be a branch sticking out from a kerbside bush and that has happened twice before with other test cars. But, all in all, if Alfa Romeo were intent on producing a car that, no matter what its other virtues were, had to be enjoyable to drive, then they have certainly achieved this. Many Alfas have excellent steering, particularly the turn-in, and the Giulia is right up to the mark once again. The ride, too, is excellent and the car is very comfortable to travel in. This is a spacious car, with a feeling that it belongs not in the C segment, but half a step further up. The boot is good, too, although with quite a high lip. You might expect that rear folding seats, 40-20-40, would be part of the basic package, but it is, in fact, part of the Driver Assistance Pack costing £1795. 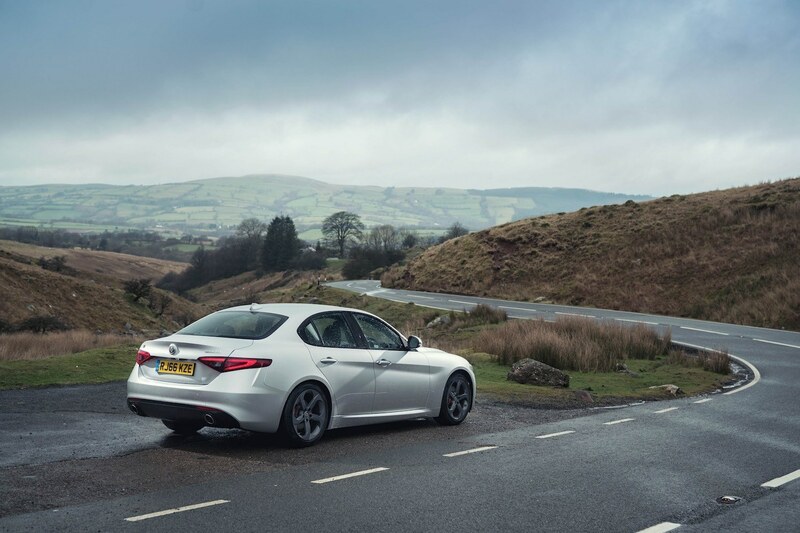 By the time you add up all the extras available, the Giulia is probably going to top £40,000. In all, there are seven ‘packages’ on offer, one of which will no doubt be easy to sell to a sporty driver who enters an Alfa Romeo dealership — the Performance Pack (£950) that includes those huge paddles, a limited slip differential and Active Suspension. For owners who are wanting a touch of luxury, it’s the Lusso Pack, in which you get lots of leather, wood accents and a heated steering wheel for £2750. For the driver, there are plenty of features aiding safe progress and, both day and night, instrumentation is simple to read. The 8.8-inch screen is good to use and Uconnect allows all the contact to the world outside the car that most will be happy with. The whole facia is very smartly-designed. I did have a couple of issues that a look at the handbook didn’t resolve. One concerned the un-necessarily loud alarm sounding when locking or unlocking the car (why is this necessary? ); the other was more annoying: for absolutely no obvious reason, and apparently, quite randomly, I was loudly alerted to check the entire surroundings of the car, presumably for potential bumps or collisions. This happened in both of the test cars and rather spoilt my overall impressions of a really enjoyable car. The Giulia easily got the most admiring looks and comments of any test car for a long while, even attracting passengers to gape out of the windows of other cars on the motorway. It’s great to have Alfa-Romeo back with what could be a great car, but possibly sorting a few small issues would make it just even better.